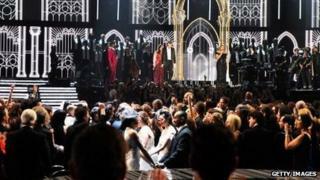 The 56th Grammy Awards were held last night, and while there were no twerking incidents to stir controversy, a planned marriage ceremony for 34 gay and straight couples officiated by Queen Latifah in the middle of the rap by Macklemore and Ryan Lewis about marriage equality (with a cameo by Madonna) had people talking. "It was a brave move by the rap duo who are just experiencing their first flush of fame, but it showed the Seattle based duo are serious about using their profile to push a progressive message," writes the New York Post's Hardeep Phull. "It's something that pop stars seldom do for fear of losing fans, but Macklemore & Ryan Lewis showed that they have guts as well as talent." Actress/producer/director Elizabeth Banks tweeted that the performance "just changed the big world a little for the better". Bustle's Lindsay Mannering wrote: "When Madonna, dressed in a white tuxedo with a white cane and cowboy hat emerged, it was hard not to push out your lips and think aloud to no one in the room, 'yeah, this is pretty cool'." Reaction to the performance wasn't universally positive, however, with criticism coming from several directions. The conservative Media Research Center's Tim Graham took offence at the social criticism in Macklemore's rap, calling it "a piece of musical agitprop to mock the traditional values of conservative American Christians, Jews, Muslims, and others. Entertainers never want to have a debate, just a series of arrogant 'statements' with no opportunity for a conversation as they flush the Bible on national TV." Others wondered about the self-consciousness in the lyrics of Macklemore's rap, Same Love. "For a pro gay song, this sure does feature a lot of Macklemore clarifying that he's straight," tweeted Ronan Farrow. Mary Lambert, Madonna, Ryan Lewis and Macklemore performed a song about how Macklemore Believes In Gay Rights And Can Lecture You On Intolerance Because When He Was In Third Grade He Thought He Was Gay (But He Wasn't Though) But, Like, The Point Is, He Gets It (Repeat: The Mack Has Always Liked Girls) while 34 couples (gay and straight) were married by Queen Latifah. The Daily Beast's Marlow Stern called the number "downright offensive", for which he blamed the airing network, CBS. "Unfortunately, those watching at home didn't get to see any of the gay couples actually kiss since CBS - in a baffling decision - pulled away the cameras, choosing to instead focus on Madonna fumbling about with a cane while mumbling the words to Open Your Heart," he writes. Of course, the broadcast wasn't all gay marriage and rapping for equality. There were other moments to get folks worked up into a lather. Katy Perry and Juicy J, for instance, had a goth-inspired performance of Dark Horse that the Blaze's Wilson Garrett called an "alternate reality where Voldemort won and Hermione became an evil stripper." The night was filled with what now has become a regular progression of new and old stars billed as "Grammy moments", with varying levels of success. The Los Angeles Times's Mikael Wood called them "better than usual", and singled out Stevie Wonder's collaboration with the robot-garb-clad French group Daft Punk (the big award winners of the night) as particularly noteworthy. Chicago sounded like they belonged on a cruise ship. Madonna looked like she was trying to hide her age by paling herself out beyond belief, and the pimp cane seemed like a walker. Lindsey Buckingham's guitar sounded great with Nine Inch Nails, but his singing didn't mesh. In the end, there was something in the three-hour-plus show for everyone to love - or hate. As Time magazine media critic James Poniewozik tweeted: "Nice to see someone put on a show all generations can be mortified by together."